A very strong story: Patty Davis, a spokeswoman with the U.S. Consumer Product Safety Commission, said the toxic chemicals do not get out of the mattress. But then the reporter showed the CPSC report and said: "But that's not what the CPSC's own scientific report says." The report shows toxic and cancer causing chemicals do leach from mattresses and are absorbed by our bodies. The story interviewed Dale Guyer, MD, who said he is now finding Antimony in peoples bodies, one of the FR chemicals now being added to mattresses. Guyer said. "This could be a potential serious health risk for a lot of people and they aren't even aware of it. "They interviewed Amy Beechy, who got sick from her mattress and said: "I had flu like symptoms like fatigue, headaches, my eyes would burn," Beechy stopped sleeping on the mattress and immediately began to feel better. "At several factories around the country, the people who make mattresses say they're suffering health problems, too. WTHR talked to workers at a large mattress plant [Not Simmons] who say they and dozens of their co-workers have gotten sick in the past eight months. "We've seen rashes and skin irritations, headaches, sore throats..." said one of the workers. "I've had nose bleeds, bronchitis, and coughing," said another. "It's happening to lots of us and it's just been getting worse." They say all the health problems began last year when they started making mattresses that pass the government's new flame test. When asked if they would purchase and sleep on a mattress made at their factory, the workers said they would not." Like most stories they also interviewed Mark Strobel who has led the fight against the regulation, and they concluded by telling people the only way to get a chemical free mattress is by prescription. "What Might Be In Your Mattress? Could Mattress Safety Measures Make You Sick? The story interviewed Dr. Doris Rapp, MD, who says unsafe, several Simmons mattress factory employees who are getting sick just from handling the new flame retardant materials, Serta who admits using Boric Acid, and Mark Strobel who has campaigned and generated news against the new flameproof mattress regulation for four years. The CBS story quotes several Simmons mattress factory employees complaining of "Breathing Problems, Sharp Chest Pains, Sinus Problems, Irritated Eyes, Chronic Sore Throats, Bloody Noses, and Painful Skin Rashes." In one scene a Simmons executive says they offer employees protection as the reporter picks up a dust mask/respirator. The only thing wrong in the story was that they said "Manufacturers have to tell you what chemicals are in the mattress, but you have to ask." This is simply untrue, there are no labeling requirements, and a Simmons executive they interviewed said "We don't want to put our recipe out there." The story concludes by telling people the only way to get a chemical free mattress is by prescription. Another strong story: "It sometimes is the only thing that will eradicate roaches from a building," explains retired Cincinnati Fire Chief Bill Kramer, now University of Cincinnati fire science professor. "It would not be something I would use as a first choice to create a flame retardant for a mattress." He fears the flame-retardant chemicals in new mattresses could do more harm than good. "In their zeal to protect us from ourselves, some of these government agencies can go too far," Kramer said. "Sometimes, the cure they come up with is worse than the malady it's designed to correct." In truth, no one knows the long term effects of sleeping every night a fraction of an inch from boric acid, antimony and other toxic flame retardants, and that unknown is what worries fire science professor Bill Kramer. "I was a Marine Corps officer during the Vietnam era," Kramer said. "And it took us many decades to realize the effects of Agent Orange. I would certainly not like to see something like that transpire here." "It's proven you're going to absorb a daily dose that's twenty-seven times the EPA says is safe," Strobel said. The only way to get a new mattress without any flame retardant is by prescription. If your doctor or chiropractor prescribes a chemical-free mattress, people like Strobel can make one for you. "If I have it, you have it, we all have it," Pingree said. We all have it, because for 30 years, flame-retardant chemicals - hundreds of millions of pounds of them - have been embedded in furniture and consumer products, in an effort to slow down fires and reduce deaths and injuries. They show video of mattress manufacturing and the new mattress open flame test. The mattress factory video is the same as used in the NBC Indianapolis Toxic mattress story where the workers report getting sick from the flame retardant chemicals in the mattresses. "They can affect the developing brain and they can affect the developing reproductive system," said EPA senior toxicologist Linda Birbaum. Despite the growing concern over flame-retardant chemicals, the industry, and groups aligned with industry, is lobbying to increase the use of chemicals in a wide range of consumer products. Chicago Tribune, Chicago IL, July 1 2007, got admissions from industry and top manufacturers that they really are using toxic chemicals to flameproof mattresses including, Antimony Trioxide (Arsenic), Boric Acid (Roach Killer), Silica Glass, and Ammonium Polyphosphate (Ammonia). Plus she quoted several top scientists and doctors who say this is unsafe. They also told people there is an alternative in prescription mattresses that are toxin free and allowed by the regulation. "New Fire Retardant Mattresses Source Of Toxins"
This news video ran on FOX stations across the country. Like most of the stories they interviewed Mark Strobel who says the chemicals are proven to leach out and be absorbed by our bodies, and is concerned it will harm millions of people and it will take us years to find out. CPSC says Children absorb 63 times more Poison from flameproof mattresses than the EPA says is safe. CBS Boston also interviewed Ryan Trainer of ISPA (the mattress manufactures association) who admitted manufacturers do use Antimony, but then he misstated the facts by saying Antimony could not get out of mattresses, and that testing proved it did not get out. In fact, the government proved Antimony and more does leach to the surface of mattresses in large quantities. The CPSC proved these chemicals leach to the surface of mattresses and measured significant amounts of toxins contacting our bodies. The CPSC says five year old children will absorb .5 mg Antimony (Arsenic) from flameproof mattresses, every night. This is 63 times more Poison than the EPA say is safe! They also say the average adult will absorb .8 mg Antimony every night, and this is 27 times more poison than the EPA says is safe. Antimony is one of the acutely toxic heavy metals (lead, mercury, arsenic, antimony) and is also known to cause cancer. The story was similar to the CBS Chicago story as mattress factory employees complained of "Irritated Eyes, Chronic Sore Throats, Bloody Noses, and Painful Skin Rashes." The story concludes by telling people the only way to get a chemical free mattress is by prescription. "This could be our greatest toxic disaster ever." But the CPSC admits that some of the toxins are absorbed by the body every night. And a review lab hired by the agency found serious flaws in its methodology.. questioning how the CPSC could simulate a lifetime of exposure.. the lab also questioned how the CPSC scientists decided on a higher maximum daily dose of antimony than other government agencies allow. [Mark Strobel - Mattress Manufacturer] "It's proven you're going to absorb a daily dose that's 27 times than the EPA says is safe." All new mattresses must survive this baptism by fire. Even crib mattresses. Many of those also contain boric acid.. even though the boric acid label says "keep out of the reach of children." Yet the CPSC's risk assessment specifically excluded babies and toddlers. [Mark Strobel - Mattress Manufacturer] "They made the assumption all children under five will sleep on vinyl sheets due to bed wetting problems and that's going to protect them from the toxic chemicals in their mattress." Royal Oak toxicologist Dr. Michael Harbut says if you have a waterproof mattress pad – or plastic -- on your bed – you can minimize your exposure to these chemicals. The only way to get a new mattress without any flame retardant is by prescription. If your doctor or chiropractor prescribes a chemical-free bed.. some companies can make them for you –but it can be costly. Meanwhile.. even if you ask.. manufacturers and retailers are *not* required to tell you if your mattress has toxins inside. But mattress manufacturer Mark Strobel said, "We continually find these flame retardants are harmful. [Federal regulators] ban them one after the other". Allergist Dr. Leonard Rubinstein admits the flame retardant chemicals might have a worthwhile effect, they also have the potential to harm the respiratory system. "Patients are often developing eye or skin irritation from sitting in contact with these chemicals that leach out. We are also seeing patients having headaches or neurological symptoms from some of these aromatics", said Rubinstein. (Mark Strobel/pres., Strobel Technologies) I became alarmed about the situation when I tried to find a non-toxic system for my beds and I found there weren’t any. … Ann Ilton says the fire-retardant inside her mattresses gave her blinding headaches. … the experience is dreadful. "I did have a new mattress for a while and I did have a pretty bad reaction to it," Kansas City native Richard Thompson said. ... "The research picture is still unclear," Children's Mercy Hospital environmental health hygienist Kevin Kennedy said. Right now, no federal law requires the maker of any mattress to list flame-retardant chemicals on a mattress label, but some experts say people need to know these chemicals exist in case they notice health trouble. "The more we can help them reduce that complex mix of things they're exposed to…the more healthy and more normal a life they can lead," Kennedy said. "This is close, chronic exposure, and it becomes a huge risk," Strobel said. This story interviews yet another person sick from their mattress, Cheryl Anderson, who said two different mattresses make her sick with fever and skin rashes. The story discusses Antimony, a probable carcinogen, being added to mattresses and that toxic chemicals are required to pass the new open flame test. Plus they told people the only way to get a chemical free mattress is with a Doctor's prescription. It concludes by telling people children under age five were not studied by the CPSC, as they assumed all these children would sleep on vinyl sheets, and that this would protect them from the toxic chemicals in their mattresses. You may have to search their site with "Sleep Concerns" to see the full video story, unless they later update this page. Chemicals in Mattresses: The story was similar to the CBS Chicago story as mattress factory employees complained of "Irritated Eyes, Chronic Sore Throats, Bloody Noses, and Painful Skin Rashes." "Many manufacturers are predicting a backlash once consumers start to investigate what's really lying under their sheets with them." "New law requires dangerous chemicals in mattresses,"
"A new epidemic that is killing cats in their twilight years, caused by chemical flame retardants … Ironically, mattress workers are coming forward and admitting they are getting sick simply handling the new chemically-laden materials, but the “S” bedding giants such as Sealy, Serta and Simmons remain tight-lipped about the chemicals contained in their beds. … To put millions of lives at risk to save a few is unconscionable." The American Chiropractor, November 2006 issue, a non-profit medical journal. Federal flameproof mattress regulation creates new health risk. The American Chiropractor, June 2008 issue, a non-profit medical journal. See the PDF file as reprinted from the magazine by clicking here. by Doris J Rapp, M.D. Doris J. Rapp, MD, F.A.A.A., F.A.A.P. Is a board-certified environmental medical specialist and pediatric allergist. She was a clinical assistant professor of pediatrics at the State University of New York at Buffalo. Dr. Rapp is the founder of the Practical Allergy Foundation and is a past President of the American Academy of Environmental Medicine. She is also the author of several books, and a New York Times Best Selling Author. The book primarily address the risks from the new fire retardant chemicals in new mattresses. ABC News, 10 News, San Diego, CA, "Is Your Mattress Killing You Softly?" Louisville Kentucky: The Courier-Journal: Mattress maker targets 'clean' niche, August 21, 2006 •• 978 words •• ID: lou33451826 Strobel leaves out fire retardant chemicals By Bill Wolfe bwolfe@courier-journal.com For nearly two years, Jeffersonville, Ind., mattress maker Mark Strobel fought a federal proposal for tougher fire standards for his industry. The new rules, he argued, would lead companies to lace bedding with toxic fire-retardant chemicals such as boric acid and antimony. "Is Your Mattress Killing You Softly? Chemical in Mattresses Could Be Toxic"
"This is no sleeper issue. ... The issue is an important one because almost everyone sleeps on a mattress. And it's big business, with about 25 million new mattresses sold annually, most made by U.S. companies." The Washington Post story was picked up by many newspapers across the country, and the issue is being featured by major market TV affiliates of CBS, FOX, and ABC. A new law already effective in California and being enacted nationwide by Consumer Products Safety Commission (CPSC) requires mattresses to resist ignition from open flames. While the CPSC and Industry public statements say these chemical systems are safe, the written word of the CPSC in their draft law says otherwise. They admit these systems have never been studied, are ‘acutely toxic’, a ‘reproductive and developmental toxin’, and more study is needed. They do say they are getting exposure data and studying them now, but we fear study will not be complete before this law is enacted and that they are trying to justify a preexisting conclusion. With the safety verdict still out, all new mattresses sold in California, and millions nationwide contain toxic chemical flame proofing systems. At least one major brand has fire proofing systems on all their new mattresses nationwide. Manufacturers, and consumers with no labeling information, must choose from one of four basic chemical systems under the ticking to meet law: 1) Boric Acid with Antimony. 2) Polyester with Antimony. 3) Fiberglass with Antimony. 4) Melamine with Formaldehyde. All four systems contain chemicals linked to cancer. Antimony causes heart muscle damage, and can cause the heart to beat irregularly or stop, and a single dermal application has killed rabbits. 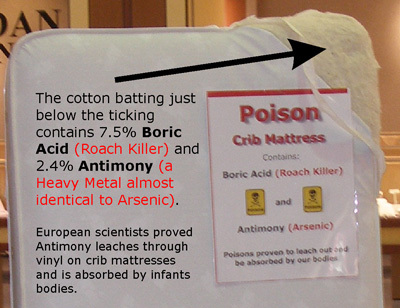 Europe has proven Antimony leaches from mattresses and it has been found in livers of dissected human infants. Quoting the Washington Post: “Serta, the second-largest U.S. manufacturer, has been using a fire-blocking system on all its products since January  that uses a blend of natural and synthetic fibers as well as chemicals. …"There is an infinitesimal level of boric acid available on the surface of mattresses," he [Serta] said.” We strongly disagree with the amount and safety of Boric Acid in mattresses. Our government says Boric Acid leaches from mattresses. There can be over one million milligrams of water soluble Boric Acid as loose dust in the surface of a mattress. As the oils in the cotton batting dry out over time much more Boric Acid will be released to kick up into our faces to breathe and absorb by our bodies. Boric Acid is poison, is used as Roach Killer, and the CPSC calls it ‘acutely toxic.’ There are 6,463 cases of Boric Acid poisoning in the US each year. We have found at least one case where an 11-year old child with chronic skin rash appears to be poisoned by boric acid in a mattress. In addition to Inhalation, skin, and damaged skin absorption, it appears children could be poisoned by sucking on a mattress. The CPSC notified California their law is invalid and unenforceable since there is an existing federal flammability law (cigarette ignition). California chooses to enforce it anyway. A lawsuit on a single point of law could stop California, federal law preempts state law. But we still have to stop the CPSC. The largest mattress companies pushed for and want this law for their own benefit. Now ISPA’s largest members, Leggett & Platt, Sealy, and Serta recently withdrew their membership. "We are putting 300 million at risk to sleeping in toxic chemicals to save 300 from fire,"
"In 2000, the National Academy of Sciences recommended that antimony -- the most commonly used fire retardant -- be banned in upholstered furniture. That recommendation was based on a 1998 European study that linked the chemical in crib mattresses to sudden infant death syndrome." Unfortunately they charge you $1.50 to view the entire article. All the other news links on our site are free. 4/28/05 "The flames engulfed one mattress, but not the Serta mattress treated with a flame retardant ... Serta uses small amounts of Boric Acid or Boron ... While other mattress makers do offer similar flame retardant products in California, Serta is the only company to use a flame retardant system on it's entire line of mattresses across the country." Our health risk other side of the story also got good coverage, and the story asks, is it safe, and is the benefit worth the risk? Fox59 TV in Indianapolis ran the story. See the story by Fox59 TV in Indianapolis, it ran as a two minute TV segment, but you can see the printed version on the Fox website by clicking here. Interestingly, this review had some data for Antimony and warned against Antimony as a flame retardant for upholstered furniture. Their grape juice comparison seems a wildly broad statement. At one hundred times more than in a year means you would absorb only .003 mg in a year. You would likely breathe more than this in a single breath while just being in the room with one of these mattresses. Our analysis shows the mattress contains 3.8 Million times more boron (found in boric acid) than found in a 6 oz glass of grape juice (.3 mg.). By comparison, you would have to drink over 200 glasses of grape juice, about 10 gallons, every day for 50 years to equal the amount of Boric Acid in a mattress. The San Francisco Chronicle, 3/2/05, Home Editor, Laura Thomas, did a 1500 word article exposing the health risks of toxic chemicals being used in mattresses to meet a new open flame resistance law. The new law is already effective in California and is being enacted nationwide by the Consumer Products Safety Commission within the next year. Laura did a great job of telling a balanced story from what people told her. But this illustrates the problem we face. Proponents whitewash the chemical issue and say they don’t use chemicals. The CPSC’s proposed law lists the various systems used to meet the standard, and their chemical content. A review of this document will prove the proponents statements wrong. The Louisville Kentucky, Courier-Journal newspaper ran a shortened version of the Washington Post story on page A-19 on Sunday May 22. They omitted the parts about Serta, ISPA, and Davis. They don't post the story on their website. Many other newspapers across the country ran the Washington Post article, but most don't post other newspapers articles on their website. The Courier-Journal: Mattress maker targets 'clean' niche, August 21, 2006 •• 978 words •• ID: lou33451826 Strobel leaves out fire retardant chemicals By Bill Wolfe bwolfe@courier-journal.com For nearly two years, Jeffersonville, Ind., mattress maker Mark Strobel fought a federal proposal for tougher fire standards for his industry. The new rules, he argued, would lead companies to lace bedding with toxic fire-retardant chemicals such as boric acid and antimony. For best results print this page in Landscape mode, or click here for printer friendly version. Notice: The statements and questions contained in this notice are not intended to convey allegations regarding any particular company, person, or association. Readers should conduct their own investigation of a company or association or person to ascertain the particular policies, practices, and motivations of that entity. I have reported what I believe to be true and correct to the best of my knowledge and opinion at the time of its writing in a free speech effort to avert a public health disaster.